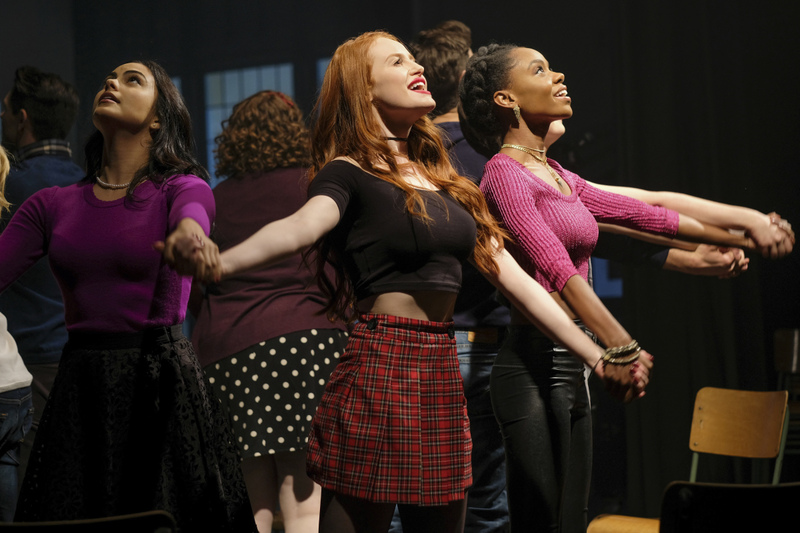 Photos From The Riverdale Musical! Preview images for the Riverdale musical episode titled "A Night To Remember"
“A Night To Remember” is the title, and among other things, we see more visual confirmation that Kevin and Fangs is going to be a thing. Pics can be found below along with a reminder of the press release. The episode airs April 18 on The CW. RIVERDALE, NY (January 24, 2018) — The Riverdale High Drama Department (RHDD), in conjunction with the Lodge Family, is pleased to present as its Spring Production, “Carrie: The Musical,” a dark-yet-catchy cautionary tale exploring the gritty realities of small-town high school life. Future Tony Winner Kevin Keller helms as director, combining iconic elements from the novel, 1976 movie, 1988 Broadway production, 2012 Off-Broadway revival, and 2013 remake to create a retro-yet-timeless interpretation of Stephen King’s horror classic. Additionally, a behind-the-scenes documentary following the making of “Carrie: The Musical” will be filmed by student videographer and journalist Jughead Jones. Mr. Jones’s documentary, entitled “A Night to Remember,” airs Wednesday April 18, 2018 (8:00 p.m. ET/PT) on the CW.